‘Jackie French: the travelling suitcase’ in iRead vol 4 2015, p 12. Stage 3 students acquainted themselves with the new OLIVER and ORBIT library system interfaces at Penrith Public School by analysing the contents of a suitcase of resources about Jackie French, the current Australian Children’s Laureate, then creating their own information products about popular authors or illustrators. View the article online HERE! ‘Authors visit schools: Anna Branford visiting Penrith PS’ in All the Buzz About Books vol 4 2015, p 10. Stage 1 students enjoyed a visit by Victorian children’s author, Anna Branford, to celebrate the release of her new Lily the elf book series, courtesy of Walker Books Australia. View the article online HERE! ‘Part 3. Robbie Rules’ first day’, in the article ‘Kindergarten: first day’ with Meredith Costain & Janet De Witt, in Scan 33(1) 2014, pp 21-25. Stage 3 students at Penrith Public School were buddies to incoming Early Stage 1 students, and created an online digital story on PhotoPeach, taking their inspiration from a new picture book by Meredith Costain & Michelle Mackintosh. Subscribers can view the article online HERE! 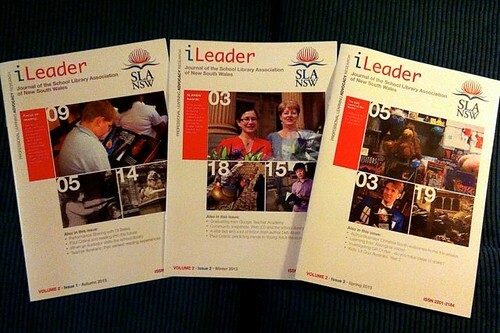 ‘The library environment: a mirror of our attitudes and expectations’ in iLeader Issue #3, Spring 2012, pp 6-8. As recipient of the joint SLANSW/Charles Sturt University’s John H Lee Memorial Award for “excellence in leadership in innovative and collaborative teaching practice through the integration of learning technologies”, Ian McLean describes the richness that is the library environment at Penrith Public School. ‘Research columns: Taking the plunge: Guided Inquiry, persuasion and the research river at Penrith Public School’ in Scan 30(4) Nov 2011, pp 26-35. Download the full, corrected, hyperlinked version of the above article as a PDF from HERE, courtesy NSW DEC’s CLIC and School Libraries & Information Literacy. ‘iInquire… iLearn… iCreate… iShare: Stage 1 students create digital stories’ in Scan 30(2) May 2011, pp 4-5. Stage 1 students narrate how they inquire, learn, create and share with ICT and Web 2.0 to produce online Photo Peach slideshows at Penrith Public School. View the article online HERE! ‘Have blog, will storyboard!’ in info@aslansw Issue #2, May 2010, pp 5-8. Stage 2 students at Penrith Public School created storyboards and PowerPoint digital stories as resources to support Early Stage 1 and Stage 1 students working on NSW DET’s Bear and Chook books rap, which ran during the subsequent term. ‘Research columns 1, 2009: Kindergarten weaves a wiki: the learners tell their stories’ in Scan 28(1) February 2009, pp 30-37. Early Stage 1 students at Penrith Public School used a wiki to create jointly-constructed fables, and share the final products (and the annotated learning journey) with their extended school community – and beyond. This research paper is introduced, and peer reviewed, by Dr Ross J Todd. ‘Exploring OASIS Web enquiry for Web 2.0′ in Scan 27(1) February 2008, pp 7-9. At Penrith Public School, the Web enquiry main screen is a gateway to the school’s new wiki pages, and is used for explicit teaching of online searching skills. ‘Circle time: maximising opportunities for talking and listening at Penrith Public School’ in Scan 26(4) November 2007, pp 4-7. Circle Time is a structured framework for social and emotional learning which promotes a positive class ethos. Moving from class teacher back into the school library, Ian McLean has incorporated Circle Time and information skills into a range of collaborative literacy and ICT activities, including book raps. ‘Book rap diary: Possum magic at Penrith Public School’ in Scan 23(3) August 2004, pp 9–13. 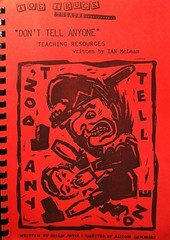 During a return to class teaching (Stage 1), Ian McLean collaborated with and the school’s teacher-librarian, Trish Ryan, on a range of teaching and learning activities in this book rap to enrich the literacy program. ‘An interview with Susanne Gervay’ in Scan 21(3) August 2002, pp 24-25. The novel, I am Jack has an anti-bullying theme. The author tells how the personal experiences of her family inspired her to write this book. ‘An interview with Boori Pryor and Meme McDonald’ in Scan 19(2) May 2000, pp 4-7. The authors of My girragundji discuss the consultative process they go through with family members, as their “first editors”, as they write their novels. Boori is the “designated” storyteller of his family. ‘Sailing home to a Future Eden: an interview with Colin Thompson’ in Scan 18(2) May 1999, pp 6-8. Prolific author/illustrator Colin Thompson discusses his body of work, including picture books, poetry, novels and online serials, in anticipation of a book rap on Sailing home, his picture book collaboration with artist Matt Ottley. ‘Meet David Legge’ in Scan 17(3) August 1998, p 9. An interview with author/illustrator David Legge (of Bamboozled fame), to accompany an article by Jenny Foster about Winmalee Public School’s annual Read-in day. Editor of Scan (1998-2002), professional journal of the NSW Department of School Education/Education and Training. ‘Putting parents in the picture at Punchbowl Primary School’ in Scan 14(1) July 1995, pp 32-35. A visit by children’s author Libby Gleeson capped off an integrated approach to enlighten a school’s multicultural community about the benefits of picture books and reading. ‘The mark of The Paw: an interview with children’s author, Natalie Jane Prior’ in Scan 13(3) July 1994, pp 10-12. The author discusses her Amabel novels, plus upcoming picture book sequels to The Paw, her first non fiction title, Bog bodies, mummies and curious corpses, and her live performances. ‘Paul Jennings goes Round the twist… again!’ in Scan 12(3) July 1993, pp 14-16. An interview with artist Glenn Lumsden and writer/colourist David de Vries about Round the twist graphic novels, based on Paul Jennings’ short stories. ‘Don’t tell anyone: teaching resources’, Toe Truck Theatre, 1988. Photographs and interview in Number 96: Australian TV’s most notorious address by Nigel Giles, Melbourne Books, 2017, pp 294-5, 306. Assemblage art in Trousseau zine, edited & published by Kat Mayo, 2015. Interviewed for article, “Best bloggers” in Independent Education, 44(1) 2014, Independent Education Union, pp 28-29. Photographs in Star Trek: The complete unauthorized history by Robert Greenberger, Voyageur Press, 2012. Photographs of 2012 SLA NSW Award recipients’ cocktail party featured in iLeader, Winter 2012, SLAnsw, pp 16-17 and Scan 31(2) May 2012, p 50. Share this: Creative Commons on Flickr strategies featured in Scan 30(3) August 2011, p 44. ‘Storytime success’ photograph featured in Australian teacher magazine, July 2011, p 28. ‘All Black Day: Christchurch Earthquake Appeal 2011’ Photo Peach slideshow featured in ‘Dux’, Daily Telegraph, March 31, 2011, p 34, and Scan 30(2) May 2011, p 47. ‘Student participation: Bushranger bounties’ in Improving students’ web use and information literacy: a guide for teachers and teacher librarians by James E Herring, Facet Publishing (UK), 2011, p 123. ‘Lisa Shanahan and Emma Quay’ in News & views Issue #4, NSW Branch of CBCA, November 2009, p 6. A report on NSW DET’s Bear and Chook books rap for K-6 students, teachers and teacher librarians, conducted on a blog. Shoestring makeover photographs in ‘Rethink, reinvent, rejuvenate and brand: from notes supplied by Kevin Hennah’, FYI, vol 13(2), Autumn 2009, p 9. Photographs in Chewing gum: how it fed the gods, went into space and helped win the war [‘Ubiquitous things’ series] by Natalie Jane Prior, Hodder Headline, 2000, p 43. ‘Leonard John Crofoot’, an interview in Star Trek: The Next Generation magazine, Vol 26, Starlog Press (USA), 1993, pp 37-40. ‘The magic prop box’ in When are we going to have more drama by Peter Moore, Thomas Nelson Australia, 1988, p 51.